Over 45 years of Mercedes-Benz Vans Experience. Danny joined the Lone Star Vans team in 2016, but has worked in the automotive industry for over 30 years. When not at Lone Star, you can usually find him at the golf course or on his mountain bike, if he’s not watching F1 that is! 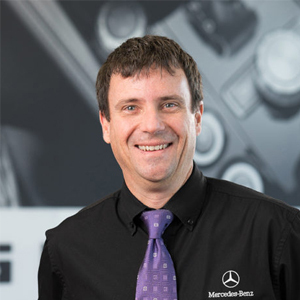 Danny’s favorite thing about working for Lone Star is the team he gets to work with, and he’s a fan of the Sprinter 4×4, and the AMG GT R, of course!